This is a guest post by the Rev. Greg West. Greg is pastor of the Puerto de Gracia Hispanic outreach at Grace Harbor United Methodist Church in Suffolk. This article was originally published in the April 2010 issue of the Virginia United Methodist Advocate and is used here with permission from the Virginia Conference of the United Methodist Church. Lloyd Bolt (center) “joined the great fiesta in the heavens one year ago,” says the Rev. Greg West. Bolt is surrounded by some of his grateful amigos. “Porque nuestra ciudadanía está en los cielos, de donde también esperamos ardientemente al Salvador, el Señor Jesucristo” — (Filipenses 3:20). “But our citizenship is in heaven. And we eagerly await a Savior from there, the Lord Jesus Christ. — (Philippians 3:20). Friendships with the amigos happened quickly as they are so appreciative of any “gringo” who speaks some Spanish; and a partnership with Lloyd, a faithful Quaker brother, began. The majority of our amigos come from Mexico and Guatemala on a government H2B visa, which enables them to work in the United States about nine months of every year. Over the last seven years we have gathered with them for fellowship, worship, teaching both the Scriptures and English. One of our goals in mission at Grace Harbor is to establish long-term relationships with brothers and sisters and churches in Latin America. I didn’t know exactly how this would work, but I knew it was God’s heart. We have had a faithful team of friends who found it a blessing to share life together with the amigos. Lloyd Bolt often led the way as we connected the amigos with doctors and dentists, fought bedbug infestations, helped when the Hispanics were victims of crime, and met various other needs. 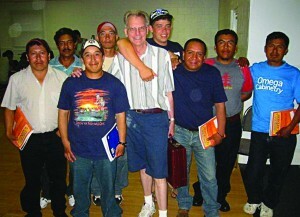 Lloyd traveled to some of the cities and pueblos where the workers lived, always receiving a big welcome. He brought video greetings from their husbands, sons, brothers, cousins and friends. These always turned into large gatherings and celebrations. Then Lloyd would film the families in Mexico and play those videos here to a full house. These were beautiful, moving and sometimes agonizing moments. I watched as fathers saw their newborn children for the first time via video. I saw expressions of love and caring touching the hearts of these men so far from home. I witnessed a broken-hearted wife with children in her arms appealing to her faraway husband to break off the affair. While mission was a strong focus of mine in seminary, I underestimated the power of simple acts of love to accomplish God’s mission in the world. One of the greatest joys in being with our amigos is experiencing how the gospel transcends cultures, nationalities and geography! When a young man from Chiapas, Mexico, with dark skin and Mayan features trusts in Jesus to rescue him from his sins, new life comes just as it happens with all who trust in Christ! If we would see the sovereignty of God as well as the systemic injustice in so many of the people movements around the globe, then the church would mobilize to offer them Christ in word and deed.